El presente artículo muestra el desarrollo y ejecución de una animación de un robot hexápodo en entornos de realidad virtual mediante el uso del software Unity. El movimiento del robot es de 18 grados de libertad, los cuales están basados en servo motores que se controlan por medio del uso de un micro controlador; además se muestran los procesos necesarios para transferir el diseño 3D del robot hexápodo realizado a partir de un software CAD (Diseño asistido por computador) a un entorno de realidad virtual sin que las características físicas del diseño original se pierdan. Finalmente, se presentan los resultados obtenidos de la simulación de movimiento y respuestas del robot hexápodo a perturbaciones como rugosidad del piso, suelo irregular, gravedad entre otras; permitiendo una correcta evaluación a posibles diseños de robots antes de ser elaborados. Al Mashagbeh, M., & Khamesee, M. B. (2015). Unilateral teleoperated master-slave system for medical applications. IFAC-PapersOnLine, 48(3), 784-787. Andaluz, V. H., Chicaiza, F. A., Gallardo, C., Quevedo, W. X., Varela, J., Sánchez, J. S., & Arteaga, O. (2016). Unity3D-MatLab simulator in real time for robotics applications. Paper presented at the International Conference on Augmented Reality, Virtual Reality and Computer Graphics. Andaluz, V. H., Quevedo, W. X., Chicaiza, F. A., Varela, J., Gallardo, C., Sánchez, J. S., & Arteaga, O. (2016). Transparency of a bilateral tele-operation scheme of a mobile manipulator robot. Paper presented at the International Conference on Augmented Reality, Virtual Reality and Computer Graphics. Ardakani, M. M. G., Karlsson, M., Nilsson, K., Robertsson, A., & Johansson, R. (2018). Master-Slave Coordination Using Virtual Constraints for a Redundant Dual-Arm Haptic Interface. Paper presented at the 2018 IEEE/RSJ International Conference on Intelligent Robots and Systems (IROS). Bonilla, V., Moya, M., Evgeny, A. V., Lukyanov, A., & Leonardo, M. (2018). Modeling and simulation of the Mitsubishi RV-2JA Robot controlled by electromyographic signals. Enfoque UTE, 9(2), 208-222. Carlson, J., & Murphy, R. R. (2005). How UGVs physically fail in the field. IEEE Transactions on robotics, 21(3), 423-437. Chamorro, W., & Rueda, P. V. (2018). Linear Quadratic Regulator and Model Predictive Control Applied to a Four-Tank System: A Performance Comparison. Enfoque UTE, 9(1), 204-216. Christ, R. D., & Wernli Sr, R. L. (2013). The ROV manual: a user guide for remotely operated vehicles: Butterworth-Heinemann. Cully, A., Clune, J., Tarapore, D., & Mouret, J.-B. (2015). Robots that can adapt like animals. Nature, 521(7553), 503. Desbats, P., Geffard, F., Piolain, G., & Coudray, A. (2006). Force-feedback teleoperation of an industrial robot in a nuclear spent fuel reprocessing plant. 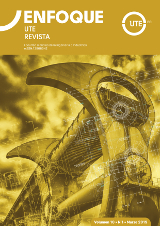 Industrial Robot: An International Journal, 33(3), 178-186. Enríquez, D., Guerrón, G., & Moya, M. (2018). Mechatronic Mobil System for Telemedicine. Paper presented at the 2018 International Conference on Information Systems and Computer Science (INCISCOS). Faria, B. M., Reis, L. P., Lau, N., Moreira, A. P., Petry, M., & Ferreira, L. M. (2015). Intelligent wheelchair driving: bridging the gap between virtual and real intelligent wheelchairs. Paper presented at the Portuguese Conference on Artificial Intelligence. Freund, E., & Rossmann, J. (1999). Projective virtual reality: Bridging the gap between virtual reality and robotics. IEEE transactions on robotics and automation, 15(3), 411-422. García, J. C., Patrão, B., Almeida, L., Pérez, J., Menezes, P., Dias, J., & Sanz, P. J. (2017). A natural interface for remote operation of underwater robots. IEEE computer graphics and applications(1), 34-43. Kenneally, G. D., De, A., & Koditschek, D. E. (2016). Design Principles for a Family of Direct-Drive Legged Robots. IEEE Robotics and Automation Letters, 1(2), 900-907. Lawrence, D. A. (1993). Stability and transparency in bilateral teleoperation. IEEE transactions on robotics and automation, 9(5), 624-637. Mukherjee, J. (2014). Fast visualisation technique for view constrained tele-operation in nuclear industry. Paper presented at the Information Science and Applications (ICISA), 2014 International Conference on. Najmaei, N., Asadian, A., Kermani, M. R., & Patel, R. V. (2016). Design and performance evaluation of a prototype MRF-based haptic interface for medical applications. IEEE/ASME Trans. Mechatronics, 21(1), 110-121. Pacchierotti, C., Tirmizi, A., & Prattichizzo, D. (2014). Improving transparency in teleoperation by means of cutaneous tactile force feedback. ACM Transactions on Applied Perception (TAP), 11(1), 4. Ponce, R., Canchingre, G. M., Velarde, P., & Moya, M. (2018). Design and Construction of an Automatic Transport System Inside the Home for People with Reduced Mobility. Paper presented at the 2018 International Conference on Information Systems and Computer Science (INCISCOS). Pourebrahim, M., Ayati, M., & Mahjoob, M. (2016, 27-29 July 2016). Design and implementation of PI and fuzzy PID supervisory controllers for a flexible link robot. Paper presented at the 2016 2nd International Conference on Control Science and Systems Engineering (ICCSSE). Sánchez, M., Bonilla, V., Moya, M., & Mosquera, G. (2017). Analysis and Construction of a Mobile Robot for Search and Mitigation of Low-Scale Fire. Paper presented at the Information Systems and Computer Science (INCISCOS), 2017 International Conference on. Yoshida, K., Wilcox, B., Hirzinger, G., & Lampariello, R. (2016). Space robotics. In Springer Handbook of Robotics (pp. 1423-1462): Springer.